LAWRIE Sloan bleeds red and white, the colours of the mighty Bloods. Lawrie loves the Warrandyte Football Club and makes no bones about it. His passion for the club shows in his face as he talks to the Diary about his 65-year association with the Bloods. He is also passionate about his long time partner Rose Jackson and tells the Diary about his hurt when he was cut off from the Catholic Church because of his divorce from a marriage 45 years ago. The football experience began for Lawrie in 1950 when he donned a white shirt and ran boundary for the local team when he was only 11. Three years later he pulled on the red and white jumper and began playing with the seconds. “I was only a skinny kid and got belted around a bit when I played up against the fully grown men,” Lawrie said. Although Lawrie managed a fewgames in the firsts, he mostly represented the club playing in the reserves. Lawrie retired from the field at the end of the ’63 season and joined the committee the very next year, saying it was a very political situation in those days and quite a few players left the club. After the issues were resolved, the previously disgruntled players returned to the fold and reunited into what became a mighty local team winning the 1966 Grand Final. The celebrations in the clubrooms that night were legendary and well remembered. The players and supporters danced joyfully in a giant circle with their arms around each other and sang the club song well into the early hours. “It was a home-grown team,” Lawrie recalls. The local boys in the 1966 super team included five sets of brothers who were all born and bred in Warrandyte, including: Laurie and Johnny Warr, Billy and Barry Valentine, Tobyand Brian Thomas, Ron and Brian Tomlinson and Paddy and Joey Read. Other locals were Tommy Kerkhof, Frank Schubert, Robert “Butch” Stewart, Ken Sergeant, Alan Cornhill, Keith Rochow and John “Smithy” Smith. The club achieved more success as the years went by, winning more premierships in 1983, ’93, ’99 and 2006. Lawrie shared his life and love of the footy club with his long time partner of 43 years, Rose Jackson. They have both been great servants to the club and Lawrie proudly showed the Diary the awards Rose had won. They have pride of place on a table in his home and sit next to the many trophies and citations that he has been awarded. Unfortunately, Rose passed awaytwo years ago after a long battle with breast cancer. The Sloan family has been in Warrandyte since 1851 when Lawrie’s forebears came to mine gold at the start of the gold rush. Although Lawrie is from one of our oldest families he went to school at St Mary’s in Ringwood. “That’s because I was a Catholic then,” said Lawrie, whose faith has been somewhat diminished after he was cut off from the church after he was divorced in 1969. That was the custom of the day. The experience of being cut off from the church of his faith affected Lawrie profoundly and the hurt cut deeply. “I received a letter from St Patrick’s Cathedral informing me that I could no longer take communion or go to confession. That letter stuffed up my life a fair bit because I couldn’t get married to Rose if I couldn’t receive the sacraments. I was devastated by that letter because it prevented me from marrying the love of my life,” Lawrie said with sadness. The Sloan family’s long association with the Catholic Church began when the first mass in Warrandyte’s history was held at Lawrie’s grandparents’ home in 1896. When they celebratedthe centenary of that mass in 1996, Lawrie was an invited guest but ironically couldn’t receive the sacraments on that occasion. Recently a chance meeting with a priest has changed all that. In March of this year, Lawrie was in Box Hill Hospital with a chest infection when a Catholic priest who was doing the rounds approached his bed. After Lawrie told him his story the priest informed him that times had changed and then he absolved him and blessed him and gave him communion for the first time in 45 years. He told Lawrie that he could return to the church anytime he liked. Lawrie has a life threatening kidney disease but he keeps it in remission by attending dialysis sessions three times a week. 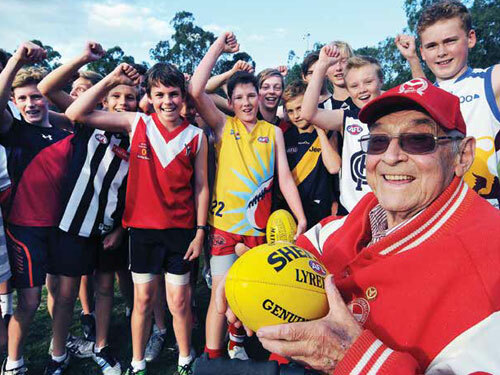 Bloods in the blood: Lawrie Sloan with junior Warrandyte footballers recently and (right) with Rose Jackson.